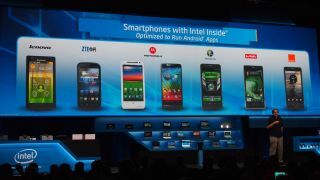 Intel led its CES 2013 press conference with the debut of Bay Trail, the next-generation 22nm quad-core Atom tablet platform. It has more than double the computing performance of the existing Medfield Atom Processor Z2760 platform, but it won't appear in devices until late in the year and will usher in designs as thin as 8mm. Among the other announcements was a new smartphone platform for emerging markets plus details of thinner and lighter Ultrabooks. The announcements were outlined by Mike Bell, vice president and general manager of the Mobile and Communications Group, and Kirk Skaugen, vice president and general manager of the PC Client Group at Intel. Crucially, Skaugen announced that not only would wireless display and touch be a staple of the next-generation Ultrabook platform (alongside the next-generation Intel Core chips) but he also said there would be a new set of low-voltage current-generation Intel Core processors set at a mind-blowingly low 7W, having previously said it would have parts at around 10W. Intel is clearly set on destroying any chance of ARM processors getting into the serious Windows market because of their low power advantage. After having previously had ARM-based Windows RT on its Yoga 11, Lenovo has now turned to these new Intel chips for its Yoga 11S. It's a clear demonstration that the strategy over Windows RT hasn't worked, either for Microsoft or its partners. Intel also wants to attack ARM in phones as well, of course, and it debuted its previously-leaked Lexington Atom platform which is designed to target the cheaper smartphone segment – Intel quoted analyst stats which suggest sales of 500 million units by 2015. Acer was one of the manufacturers outed by Intel as a launch partner. It's still to Intel's detriment that it hasn't managed to get too many big name phone partners involved, though Motorola has previously pledged support for Intel chips, of course. "The addition of the low-power Atom platform further rounds out our expanding portfolio of smartphone offerings," said Bell. Emerging markets are where phones featuring this chip will mostly be sold. But the feature spec of the Z2420 platform is anything but low end with speeds of 1.2 GHz, hyper-threading, 1080p hardware-accelerated encode/decode, and support for up to two cameras with burst mode. The platform also includes the Intel XMM 6265 HSPA+ modem with dual-SIM capability. There will also be another Z2580 platform targeted at performance phones – it's dual-core, but will offer twice the performance of the existing Z2460. Intel also talked up its so-called 4th generation Intel Core processor family, promising to deliver up to 9 hours of continuous battery life. To demonstrate the impact of the 4th generation Intel Core processor family, Skaugen showed a new form factor Ultrabook detachable reference design (codenamed "North Cape") that converts into a 10mm tablet and can run on battery for up to 13 hours while docked.